Effective forecasting, planning, and scheduling is fundamental to productivity-and ERP is a fundamental way to achieve it. Properly implementing ERP will give you a competitive advantage and help you run your business more effectively, efficiently, and responsively. 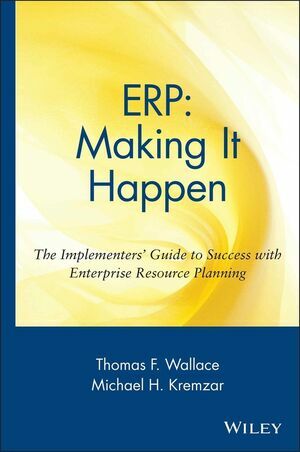 This guide is structured to support all the people involved in ERP implementation-from the CEO and others in the executive suite to the people doing the detailed implementation work in sales, marketing, manufacturing, purchasing, logistics, finance, and elsewhere. This book is not primarily about computers and software. Rather, its focus is on people-and how to provide them with superior decision-making processes for customer order fulfillment, supply chain management, financial planning, e-commerce, asset management, and more. This comprehensive guide can be used as a selective reference for those, like top management, who need only specific pieces of information, or as a virtual checklist for those who can use detailed guidance every step of the way. THOMAS F. WALLACE has spent his career writing, teaching, and helping manufacturing enterprises to operate better. He is currently a Distinguished Fellow of The Ohio State University's Center for Excellence in Manufacturing Management. MICHAEL H. KREMZAR recently retired from his position as Vice President of Product Supply at Procter & Gamble, where he worked for nearly forty years. During that time he was a catalyst and leader in P&G's highly successful implementation of global ERP. Going on the Air--Basic ERP (Phase I). Going on the Air--Supply Chain Integration (Phase II). The Strategic Future (Phase III). Appendix A: The Fundamentals of Enterprise Resource Planning. Appendix B: Plant Floor Organization Formats: Job Shop versus Flow Shop. Appendix C: Sample Implementation Plan. Appendix D: ERP Support Resources.